You can't imagine a puzzle simpler than this. Just three regular boards, three cuts, that's all it is. 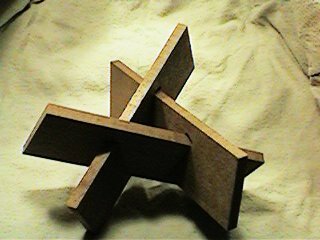 And still it's a three-piece coordinate-motion puzzle. 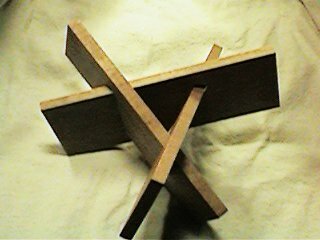 This is a self-locking wooden knot, an impossible construction from a carpenter point of view. To assemble it you have to place all three pieces in their outmost positions first and move them all to the center at the same time. The trick is to find these outmost positions. When assembled it's virtually impossible to remove just one board. 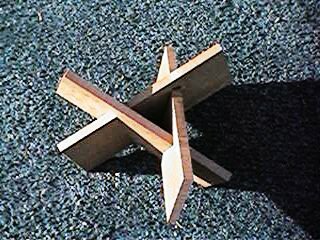 The Tri-Board puzzle - easiest to make, still a challenge to assemble.